Holy … ! THE EYES, THE EYES! That is one nasty minifig. You may kiss the bride… I don’t think so. 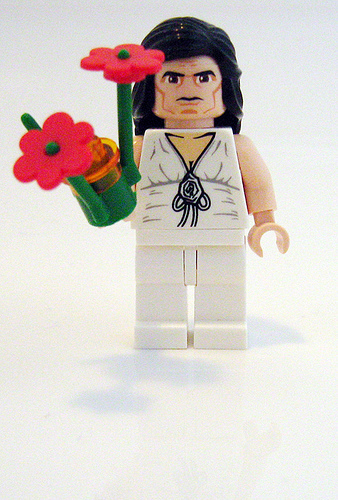 It looks like a transvestite Conan the Barbarian. I cannot unsee what my eyes have seen….I’m scarred forever! LOL. I don’t know about you guys, but I can’t stop looking at it. Oh dear lord! thats not right! Willem Dafoe in drag again, perhaps? Strong chin, aggressive stare, the brows… yep that is definitely Brooke Shields. (I mean that in the nicest way possible, I enjoy her as an actress). Reminiscent of Jim Carrey’s character Vera de Milo in In Living Color. Veracosa, Mistress of Destruction. That looks JUST like my neighbor! David: Pics or it didn’t happen. That looks like Jackie Stallone. Not right. Not right at all. holy crap! its michael jackson! RUN FOR YOUR FRICKEN LIFE!!!!! !